A rare bird, feared a few years ago to be on the edge of extinction, has been sighted in the Isles of Scilly for what is thought to be the first time. Birdwatchers have been flocking to the islands to catch a glimpse of the sociable lapwing, or plover. The Royal Society for the Protection of Birds (RSPB) said the bird originates from Kazakhstan and 20 years ago the population there was just 5000. The RSPB said the bird was on the "critically endangered" list. The British Birds Rarities Committee assesses sightings of rare birds in Britain. Its secretary, Neil Hudson, who was in the Scillies to verify the sighting, said: "It is a very rare bird in international regards. "It is on the critically endangered list." Mr Hudson said the last UK sighting of the bird was in Essex in 2005. A spokeswoman from the RSPB said: "Being on the critically endangered list means the Sociable Lapwing is under the highest level of threat there is. "It means there has been a rapid drop in numbers." 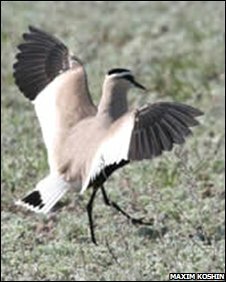 The organisation has been working on a joint project with its Kazakhstani counterpart, visiting the country's remote steppes to map sociable lapwing colonies and tag birds. The spokeswoman said the bird spotted in the Scillies may have been blown of course as it migrated from Europe to India or Africa.